For accounting student Chereese Langley, '18, accounting is in her blood. "Believe it or not, my mother inspired me to become an accountant. My mom has always been a hard worker and her dedication has led her to become a controller at a company called Metaldyne. Growing up, I would always enjoy visiting her at work, learning new things in her office, and helping her out with month and year-end. That experience has definitely led me to where I am today. I aspire to follow in her footsteps by becoming an accountant and hope to be as successful as she is one day." For one weekend each month and two weeks in the summer, Chereese sheds her role as a typical college student and assumes her duties as an active member of the Army National Guard. While her classmates are worrying about academics, spending time with friends and filling their evenings with extracurricular activities, Chereese is serving her state and her nation in this vital role. "I have learned discipline, leadership skills and how to adapt to any type of environment. This experience has given me a dose of reality that most college students do not receive." 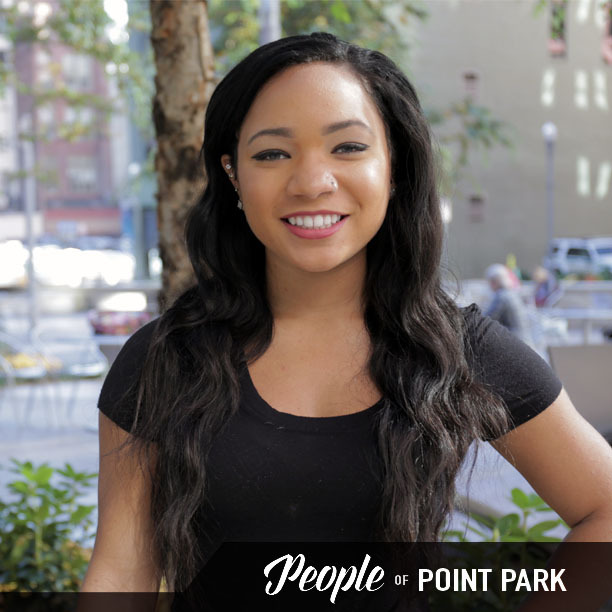 As a member of both the cross country and track & field teams at Point Park University, there is no doubt that Chereese loves to run. This year, Coach Kelly Parsley asked her to consider branching out from her usual running events and consider representing the Pioneers in the heptathlon. Heptathlon is a combined event that includes seven track & field specialties including hurdles, high jump, shot put, 200-meter run, long jump, javelin throw and a final 800-meter run. Given her incredible work ethic, discipline and desire to succeed, there is no doubt that Chereese will be a force to reckon with in the KIAC!